Sauté onion and celery in olive oil until soft, about 5 minutes. 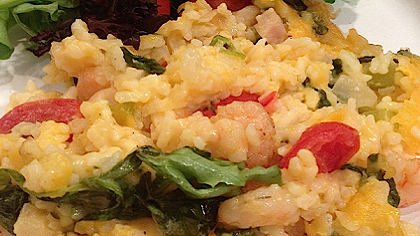 Add shrimp, tomatoes, and spinach to the pan and sauté until shrimp turn pink and spinach is wilted. Add rice, cream of mushroom soup, 1 1/2 cups cheese, and salt & pepper to taste. Mix until blended. Pour into a square or rectangular baking dish coated with non-stick baking spray. Sprinkle remaining 1/2 cup cheese on top of casserole. Bake uncovered at 350 degrees for 30 minutes or until cheese is melted and casserole is bubbly.